I just received a mail from The Tibetan Padma Karpo Translation Committee announcing the publishing of a major translation. The Sutra of the Recollection of the Noble Three Jewels is compilation of the Buddha’s teachings called “the recollections”. The recollections are widely used throughout all Buddhist traditions as a way of remembering the Three Jewels and deepening faith in them. This book is a particularly complete collection of everything needed to study, practice, and even translate the Sutra. The book starts with three chapters of introduction which explain: the origins of the Sutra; the many translation issues raised by the Sutra; and how to study and practice the Sutra. These chapters contain a wealth of material gathered and arranged in one place by the author after years of study of the Sutra. They contain something for everyone. There are discussions of faith and how to arouse it using the Sutra. There are extensive discussions of translation which are a must-read for anyone doing translation work from Tibetan Buddhist texts; they cover important issues of translation that have not been seen in print to date. Then there is helpful guidance on how to study and understand the Sutra. There is also a section on how to access the magic of fundamental reality using the Sutra. The body of the book follows. It starts with all of the source materials needed to understand, study, and translate the Sutra (see below for the list of texts included). The sources are packed with information on them and how they relate to the Sutra in the first introductory chapter. Following that, the Sutra itself in Tibetan and English is provided. 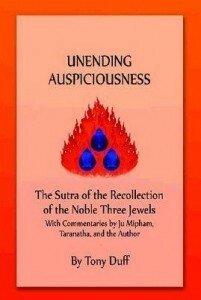 The book culminates in three major commentaries to the Sutra. The first commentary, by the author himself, was written directly in English to make it easy for English speakers to understand all the details of the Sutra and the many issues surrounding it. At the same time, it is very extensive, covering issues that even the Tibetan commentaries do not consider. For example, the author presents a number of insights taught by the vidyadhara Chogyam Trungpa when he explained the Sutra in 1982 but which seem to have been lost. It also gathers into one place the many issues surrounding the Sutra raised by the two Tibetan commentaries. The second commentary, by the extremely learned Tibetan Taranatha, has the advantage of being a shorter commentary that it is relatively to understand. The third commentary is the very extensive and rather complicated one by Ju Mipham Namgyal that has become very famous in general these days as the way to study the Sutra. Mipham’s commentary is very technical and can be hard to understand in places unless one is already very well versed in Buddhist philosophy. Therefore, the author has provided extensive notes to make it accessible. The administration of Gangteng Tulku’s shedra for his Western students has reviewed our book and the translation of Mipham’s commentary in particular and called it “superb”. They are strongly recommending it for all the shedra students. there is no link to download on this page. I just can’t find the link to download the book.